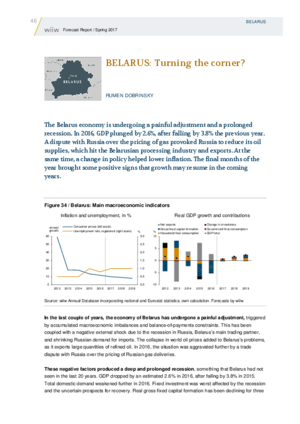 The Belarus economy is undergoing a painful adjustment and a prolonged recession. In 2016, GDP plunged by 2.6%, after falling by 3.8% the previous year. A dispute with Russia over the pricing of gas provoked Russia to reduce its oil supplies, which hit the Belarusian processing industry and exports. At the same time, a change in policy helped lower inflation. The final months of the year brought some positive signs that growth may resume in the coming years.